In addition to selling on Reverb, John Shults of True Vintage Guitar authors theTrue Vintage Guitar Blog. We recently had the chance to chat with John about the basics of Gibson flattop acoustic guitars . Be sure to check out True Vintage Guitar for even more fascinating info on Gibson and other vintage instruments. What's usually considered the Holy Grail most sought-after Gibson acoustic flat-top? What makes it so special? 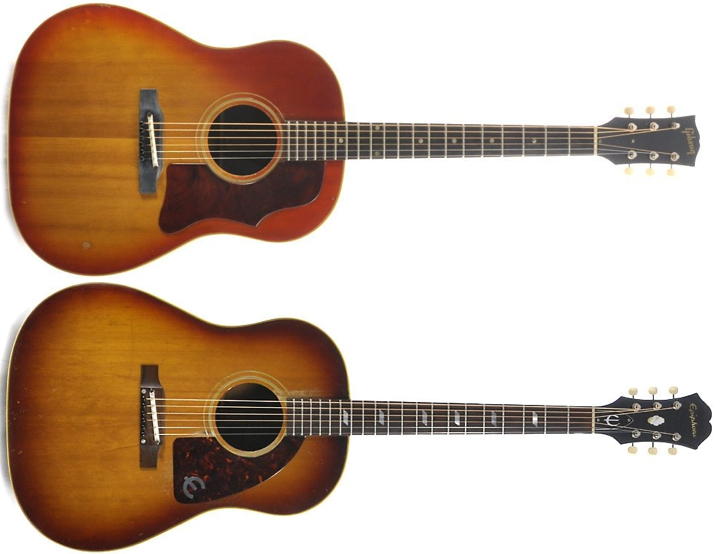 Two guitars come to mind: the 1935 Gibson Advanced Jumbo and the 1937 Gibson Super Jumbo 200. Even more specifically, I can narrow it down to two individual guitars. A dealer/collector by the name of Gary Burnette owns a prototype 1935 Advanced Jumbo in gorgeous original condition and its history and authenticity is well documented. He has put a price on it ($250k) but I doubt he would sell it to you even if you had the cash. That thing is so sweet that I’d have a tough time of it too. 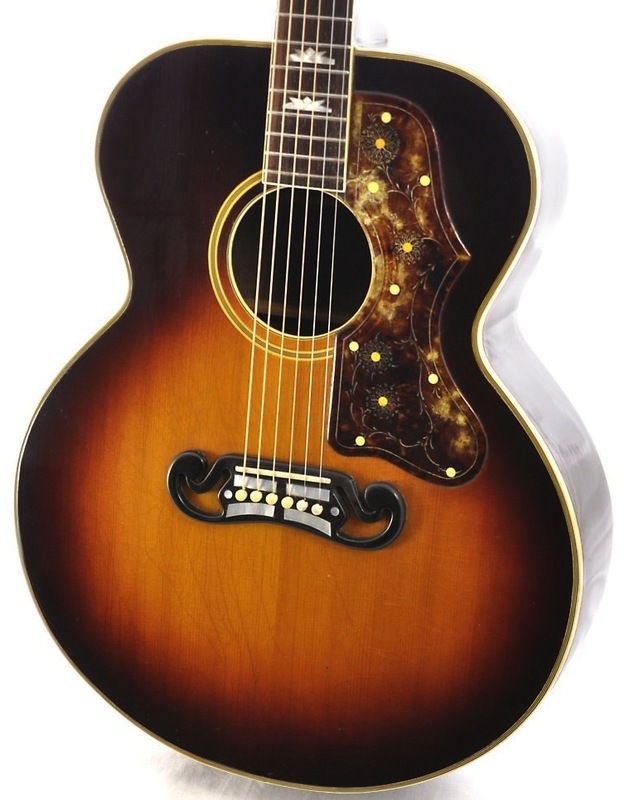 The Gibson Advanced Jumbo was constructed of an Adirondack Spruce top and Rosewood back and sides in a time period where Mahogany was the standard for Gibson. There’s still some debate on whether or not Gibson was using Brazilian Rosewood for the backs and sides of guitars at this time. The bracing on AJs were hand tuned likely all by one master craftsman since all known examples have matching plane marks. Gibson used a longer scale length (25 ½”) than the rest of their guitars to give it volume and punch. This model was produced from 1935 until 1939. The second holy grail of vintage Gibson flat-tops is the first Gibson Super Jumbo 200 that was made for singing cowboy Ray Whitley in 1937. Ray’s guitar had fancy marquetry around the edge of the top, an ornately engraved pickguard and the moustache style bridge with 4 pearl ribbons. This particular guitar is currently on display at the Country Music Hall of Fame in Nashville, TN. This model also featured an Adirondack Spruce top, Rosewood back and sides and a 25 ½” scale but had the lower bout widened to 16 ⅞”. The chevron-esque marquetry for Ray’s guitar was discontinued for the standard production. Many of these guitars were custom orders with names engraved down the fretboard. Gibson continued to produce the Super Jumbo 200 in that configuration with slight changes until about 1942. There are rumors of a few Super Jumbo 200s made during the war but I’ve never seen one. Exact production numbers for both models are not available but estimates have been made based on the shipping ledgers from Gibson. The ledgers have about 100 records of Super Jumbo 200s and about 300 Advanced Jumbos. It is unlikely that you or I will ever come across one of these in the wild but the folks at Gibson Montana do a fantastic job of recreating the magic. Both of these models are considered the holy grails of vintage Gibson because of the inverse relationship of low production numbers and very high demand. World War II greatly impacted American guitar manufactures both in terms of material shortages as well as personnel going off to fight. How did the war impact the Gibson factory and the guitars coming off the line? Indeed it did. Since Gibson is known for its poor record keeping and construction inconsistencies we are left with little information about this period. The guitars from the wartime vary wildly in materials and construction techniques. In fact, Gibson’s long time historian Julius Belson even denies the existence of Gibson flat-tops being produced during the second world war in his book, The Gibson Story. Two things that are consistent about this time period are that pretty golden banner stating that “Only A Gibson Is Good Enough” and acoustic tonal bliss. Fretboard Journal contributing author John Thomas (and my friend on the Gibson Guitar Forum) has just published a book about these guitars titled Kalamazoo Gals and I’ll happily admit that much of my knowledge from this time period comes from John’s work. It’s available on Amazon so do yourself a favor and purchase a copy of your own. The famous wartime banner headstock. One aspect of these guitars as a whole is that they were what we call “lightly built”. This refers to the relative heft of all the materials involved. This generally translates into a guitar that resonates and moves air more efficiently- and therefore louder- and has greater tonal complexity. The lightest 16” guitar I have ever held was a 1943 Gibson Southerner Jumbo that I swear defied gravity. This thing was beat to hell and back but was balanced with tonal complexity all across its range. John’s book makes the case that a good reason for this was the fact that the factory was being run by a small group of the most talented and experienced luthiers as well as women. Women at this period in time were incredibly dexterous since they had been working with their hands from a young age making clothes, etc. They were responsible for building some of the finest flat-tops ever made and yet had little to no training. Take a look inside one of these banner Gibsons and you’ll see delicate hand scalloping of the braces and thin materials. Indeed, these are functional works of art. Wartime production restrictions and materials shortages forced Gibson to reduce their flat-top models down to only six standard models: J-45, J-50, Southerner Jumbo, LG-1, LG-2 and LG-3. Other banner flat-tops are known to exist such as the rare banner L-00 but that’s just Gibson for you. Sometime in early 1943 the source for both metal and wood became scarce so strange features appeared. In place of truss rods Gibson inlaid a triangular strip of Maple and increased the width and depth of the neck to near baseball bat proportions. Lower quality, flat sawn Mahogany backs and sides are seen as well as some laminate figured Maple. Tops were made out of both Spruce and Mahogany. Some of the pieces of Adirondack Spruce were not large enough so 3 and 4 piece tops are often seen. Variations in the Spruce such as grain runout and bear claw figure are fairly common as well. Sometime in 1944 Sitka Spruce replaced the Adirondack variety and truss rods returned. So Gibson acquires Epiphone in 1958, and it seems like a lot of the Epiphones they made from '58 to '70 are almost the same as various Gibson models. What sets the two apart? Why did Gibson feel the need to produce such similar models under different brand names? The 1950s saw the unfortunate decline of Epiphone until the sale of the company in late 1957 to Gibson for a grand total of $20,000. Epiphone shipped all their leftover parts and unfinished guitars to the Gibson factory in Kalamazoo, MI. Gibson began building guitars out of the parts from Epiphone until they were used up around 1961. You can spot what I call a “New York Neck” on a Texan by the 3 piece laminate construction, V shaped neck and hex key truss rod nut. These necks were roughed out in the New York Epiphone factory and were never used. You’ll note that these necks were constructed for a 25 ½” scale length; a feature Gibson continued on their own Epiphone necks. Gibson also used some of the laminate Birch solid lining when they constructed the bodies. I call these guitars buyout period Epiphones and they are some of my favorite guitars ever to come out of Kalamazoo. A 1965 Gibson J-45 and 1965 Epiphone Texan stacked up. Little separated the Gibson and Epiphone flat-top lines during the 1960s. An obvious difference was the nomenclature and styling of the Epiphone models. Gibson continued using the prefix-number format such as J-45 while they gave names like Texan and Frontier to the Epiphone models. Construction was the same with the exception of the longer scale length and larger headstock. These guitars were not a lower cost alternative to Gibson; in fact, the Epiphone Excellente was the most expensive flat-top Gibson made at the time. The motivation for Gibson to produce a separate but similar line of guitars was to get their product in dealerships that carried Epiphone but not Gibson. Dealers at this time couldn’t sell enough guitars to maintain dealership status with both Epiphone and Gibson so they would usually only carry one. Now Gibson’s product was in both sets of retailers. By the close of the 1960s cheaper Asian made guitars were capturing a larger market share and Gibson needed a way to compete. They moved the production of the Epiphone brand overseas and manufactured a product far inferior but at a fraction of the cost to the consumer. What should buyers look for when shopping for these instruments? Buyers would do well to have a good understanding of the general features between different time periods and models. Reverb has made this research easier by using the Brands and Decades filters on the left side of the website. An interested buyer can narrow down their research to the time period they are interested in and make the overall experience more streamlined and efficient. The Price Guide on the right side of the page is another resource for buyers who aren’t entirely current on market prices. I would advise them not to be a slave to those numbers but to use it as it was intended to be: a GUIDE. Guitars that retain the original parts with no repairs and clean finishes will often be significantly higher than the price guide. Dealers have a very difficult time procuring such pieces and prefer to be fairly compensated for their diligence. On the contrary, a refinished example with a repaired headstock and changed parts at well below price guide may not always be a great deal. So get comfortable and spend some time getting used to the eye candy that’s currently on the market. Check back often because new stuff is always popping up on Reverb. What's your personal favorite vintage Gibson? This is the toughest question yet. While the holy grails and rarities will always get me going, there’s just something about a 50s Gibson J-45 or J-50 that I keep coming back to. That includes both the scalloped braced early 50s version and the later straight braced evolution. They have that quintessential Gibson woody Americana tone with stripped down, bare bones looks that kill. These are the kind of guitars I can spend a few hours on the couch with a glass of whiskey belting out my favorite songs.